The leading narrative history that students love to read, now made more relevant and accessible. 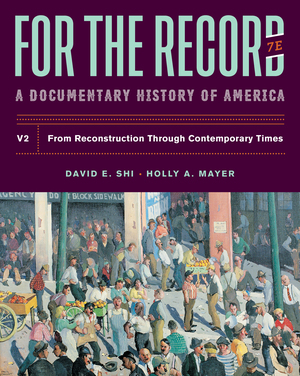 For the Record features 264 primary-source selections—both textual and visual—drawn from a broad range of government documents, newspapers, speeches, letters, and novels. In the Seventh Edition, timely new selections on immigration allow students to better understand the issues of today. 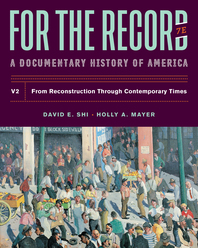 For The Record remains an incredible value as a stand-alone and is also the perfect companion reader for the America family of books by co-editor David E. Shi. An unrivalled array: 264 classic and contemporary primary-source documents and images, ranging from one to seven pages in length. Editors Shi and Mayer’s carefully crafted pedagogy helps students navigate and interpret the selections. Guided analysis of both documents and images develop students’ history skills. Selections include 37 new documents and 2 new images highlighting the role of immigration in American history. These enhance the timeliness of the readings and empower students with historical context to understand today’s issues. This reader can stand on its own, with clear chronological chapters that would work for any survey structure. As a stand-alone, it sells for much less than most of its competitors. But its best value is as a companion to any version of the America family—Full, Brief, or Essential Learning Edition. You can package it for only $10 (net) additional. Volume 1 includes Chapters 1–16. Volume 2 includes Chapters 16–32.